The 3UZ-FE engine was first introduced in 2000 and was a result of the evolution of the 4.0-liter 1UZ-FE engine. The 3UZ grown in displacement up to 4.3 liters and it was packed with all current Toyota’s systems and electronics, the same as in late 1UZ engines with VVTi. The 3UZ-FE has aluminum cylinder block with increased bore size up to 91.0 mm while the stroke wasn't changed (82.5 mm). The new block had same 90 degrees ‘V’ angle, 21 mm cylinder bank offset, and 105.5 mm bore pitch. The new cast-iron cylinder liners are thinner by 0.5 mm (1.5 mm instead of 2 mm). The thinner sleeves/liners are lighter, provide better cooling, but at the same time losing strength. For improving rigidity, the thickness of the cylinder walls was increased by 1 mm (from 5.5 mm to 6.5 mm). Also, engineers optimized the water passage shape between the bores. Like the 1UZ-FE, the 3UZ-FE engine was equipped with a forged steel crankshaft (fully balanced with five main journals and eight counterweights), forged steel connecting rods, lightweight aluminum pistons with steel struts and floating type piston pins. The engine pistons are not only increased in diameter but also have raised the position of the piston rings. The 3UZ-FE cylinder heads are almost the same. The chamber shape was changed due to the enlarged cylinder bores. In the rest, the engine heads are similar to the late 1UZ-FE heads with VVT-i. There are two camshafts (timing belt drives intake camshaft, and the exhaust camshafts are driven by gears on the intake camshaft), four valves per cylinder, solid lifters, and big valves (intake valve diameter - 34.5 mm; exhaust valve diameter - 29.0 mm; both valve stem diameters - 5.5 mm). All 3UZ-FE engines have the Variable Valve Timing - intelligent or VVT-i system and Toyota’s variable length (geometry) intake manifold named ACIS (Acoustic Control Induction System). Each cylinder has an individual ignition coil which more compact and lightweight compared to 1UZ-FE coils. The engine heads were fitted with iridium-tipped spark plugs located in the middle of the cylinders. The ignition of the 3UZ-FE is controlled by both the DIS (Direct Ignition System) and ESA (Electronic Spark Advance) systems. For faster warm-up of the catalytic converters, the 3UZ-FE has stainless steel exhaust headers/manifolds with shorter front exhaust pipes compared to the 1UZ-FE. Of course, the possibilities of modern cars require the electronically controlled throttle. In this case, the 3UZ-FE has ETCS-i system (Electronic Throttle Control System). This system monitors the idle speed (ISC system), the cruise control system, the traction control system (TRAC) and the vehicle skid control system (VSC) in Toyota’s cars. The 3UZ-FE was cut of the production in 2010. The new generation of Toyota’s V8 engines (the UR family) replaced 3UZ-FE with the new 4.6-liter V8 engine – the 1UR-FSE/FE. 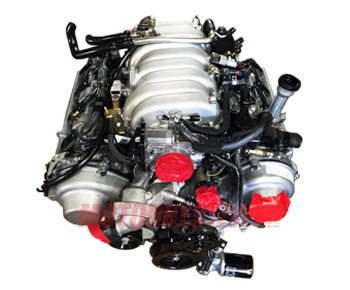 Like its predecessor and all UZ family, the 3UZ-FE is very reliable and extremely durable engine. It has no standard problems or design issues. Make required maintenance, use high-quality oil, fuel, original Toyota’s parts (filters, bolts, etc.) and the 3UZ-FE engine will run more than 300,000 miles (500,000 km). Like almost every modern engine with a timing belt. The broken timing belt will ruin the 3UZ engine. Replacing of timing belt should be made every 60,000 miles (100,000 km) or early if you noticed any damages on it.